While Bruce and I were in Berlin, I had planned a few posts that I intended to go up while we were away. Alas, my technical understanding was lacking, and they didn’t get posted. One of them was a follow-up to my piece about squabbling over the arts, which I’d illustrated with two depictions of Orpheus before and after he met his untimely death in spite of the beauty of his art. Today I give you the song that I intended to run that same week—this poignant symphonic poem by Franz Liszt on the subject of Orpheus, Part I above and Part II below. I had also selected this piece because Liszt wrote it while he was living and working in Germany—Weimar to be exact—and in one of those funny coincidences, Bruce and I, much to our surprise, ended up spending a day and a half in Weimar last week. We drove over from Berlin with Bruce’s old friend Kai, who happened to be slated to play in a tennis tournament there. While he played, we toured the ancient city and walked in the footsteps of Liszt, as well as Goethe, Schiller, Bach, Richard Strauss, Hans Christian Andersen, Wassily Kandinsky, Paul Klee, Walter Gropius, Oskar Schlemmer, and many other artists, writers, and musicians. 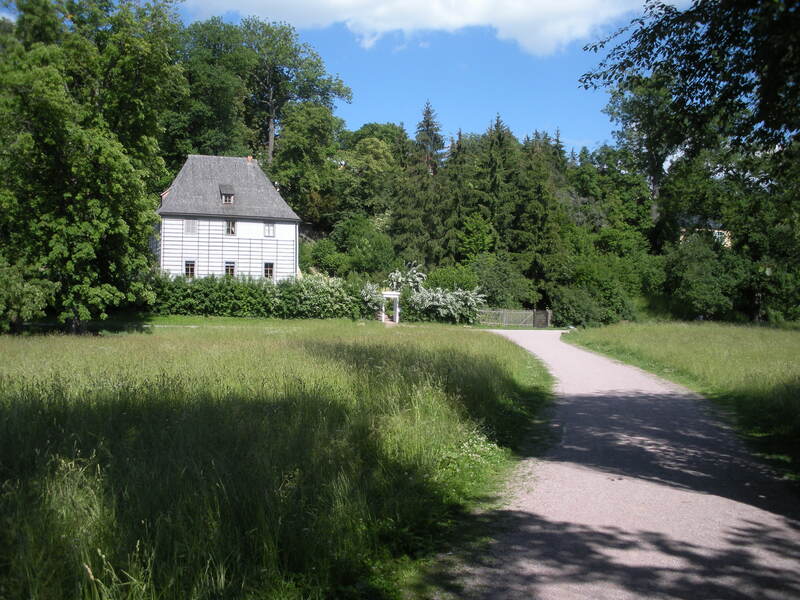 Goethe’s garden house in Weimar, Germany. It’s also difficult to imagine Weimar as an East Germany city. It retains its old-world charm because many of its buildings and monuments were spared from bombing during World War II. However, on the outskirts we found numerous of those concrete-slab high-rise apartment buildings, some of them fallen into decrepitude, typical of the cheap, radically modernist efforts of post-war Socialist architects and builders. They seemed particularly odd in the bucolic hills around Weimar. We did not visit Buchenwald—time was short, and Kai was more eager to get back to his family in Berlin. But one thing that is true in Germany is that history peeks through everywhere. The Topography of Terror memorial site sits on the location of the former Gestapo and SS headquarters, but is also rimmed by a remnant of the Berlin Wall. Even as I enjoyed the quiet, clean, and plentiful trains that made getting around Berlin so easy and pleasant, I couldn’t help but think how this train system was used and perfected in the transportation of humans to their terrible deaths. Bruce said that as he walked around Berlin he was constantly wondering, “What happened here? In this exact spot?” It’s a good question for any one of us to ask any day and in any spot. You can bet something happened wherever you are, even if it’s been covered over or obliterated by the passage of time. When I take a moment to let that reverberate in my mind and body, I am enlivened and reminded to choose carefully (and to the extent I can) which kind of path toward the future I might participate in. Posted in Culture & Arts, Music, Politics & Current Events, Visual Arts, Writing and tagged Berlin, Berlin Wall, Billy Wilder, Buchenwald, concentration camps, Death Mills, Franz Liszt, Friedrich Schiller, German Democratic Republic, Germany, Has Christian Andersen, Johann Sebastian Bach, Johann Wolfgang von Goethe, Nazis, Orpheus, Oskar Schlemmer, Paul Klee, Topography of Terror, Walter Gropius, Wassily Kandinsky, Weimar. Bookmark the permalink.